The unique design of the Lafayette Hydraulic Pinch Gauge frees the client to perform a true pinch pattern because the therapist, not the client, supports the weight of the gauge. A highly accurate pinch-force measurement is the result. It measures pinch force up to 45 pounds. Includes instructions and carrying case. 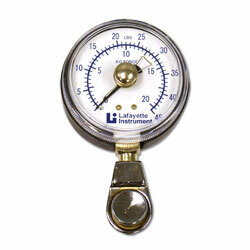 Lafayette Instrument also calibrates the Lafayette and JAMAR Pinch Gauges. If you are interested in this service, check out our Calibration Return Form.